These pictures show System is using 198.79GB which is too much to be true. This happened after migrated data from defective iMac to new MacBook Pro. Opened the drive then selected View Options to calculate all sizes. 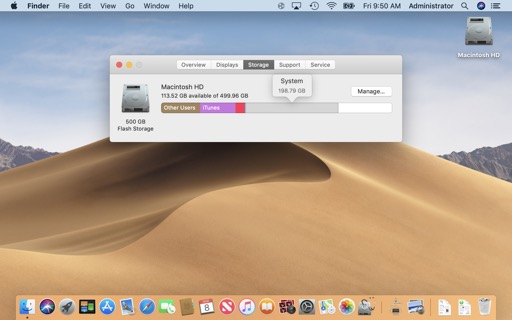 It shows Mac uses less than 80 GB. I found App called DaisyDisk which shows everything in the drive. It costs $9.99 from App Store but I thought it may worth it. DaisyDisk shows this large System file. Upon clicking it, DaisyDisk says to download its full version and it directed to its website. Got a full version (no extra cost). It revealed everything. Over 100 GB of files were in Music and Pictures folders in Shared folder in Users folder with red "Do Not Enter" icon, indicating no access to its contents. Thus, Finder will not show their sizes. I changed their permissions (Get Info). Voila! I can open them. 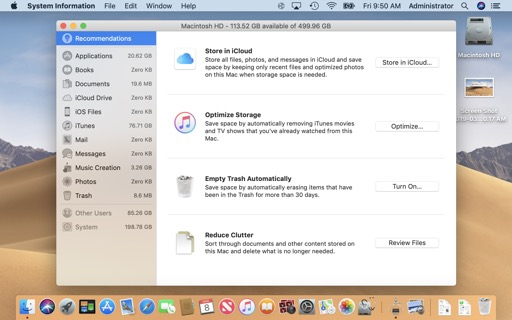 It turned out there were two users sharing these folders (Photos and iTunes) and one user was a Managed User (Parental control). Another huge System problem surfaced. The problem was traced to a corrupt mail log file in Containers. 1 TB had drive. Finder shows it is full, 10 MB left. 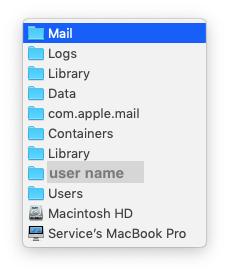 When you tell Finder to calculate each folders (Applications, Library, Users and System), they should be using only 90 GB. The problem was traced to hidden files called "Core", thanks to DaisyDisk again. Each Core file is about 650 MB but there are over 1000 of "Core" files. Removed all of them. Now, the drive has 900 GB free space.